Crazy Quilting, that wonderful Victorian pastime, is enjoying an immense resurgence in popularity. However, crazy quilting is somewhat of a misnomer. It is not quilted like a typical quilt, that is, no quilting stitches nor batting are employed in its construction. Also, one's mental balance does not have to be in question to crazy quilt! Rather, a crazy quilt is a unique conglomeration of randomly pieced fancy fabrics with embroidered embellishments on nearly every seam and patch. But it did not start out this way. The evolution of the Crazy Quilt, as we recognize it today, is a journey that illustrates the triumph of women's imaginativeness and ingenuity in the face of unimaginable trials and tribulations. The random practice of piecing odd bits of cloth together was a money saving habit from Colonial times. In the harsh and unfamiliar environment of the new world, the biggest factors needed to build a strong and enduring society required that the early settlers be hard working with a strong sense of responsibility, first to family and then to community. In the beginning, when the coverlets and blankets the colonists had brought with them began to wear out, they were patched until the cloth could no longer hold thread. By necessity self sufficient and by temperament eminently practical, when clothing and bedclothes wore out they were recycled. Worn parts were cut away and any useful pieces were recombined. From these pieced odds and ends we can readily envision how the crazy quilt came into being. It was indeed "crazy" as far as design was concerned. There was no planned design in shape, arrangement of color or use of materials. Similarly, as the parents' clothes wore out, if there was a large enough area left without holes, these pieces were used to fashion a child's dress or trousers first and only after that was every other usable odd shaped piece left over scrupulously saved and kept together until there was enough left for a quilt. Plaid woolens might be sewed next to a triangle cut from red woolen underwear. As new material was woven, scraps of "linsey-woolsey" and "shoddy" got mixed in with the precious all-woolen material. Linen was also used and later when chintzes and calicoes were imported from beyond the "Horn", these eventually found their way into the quilts as well. Of course, none of these early pieced quilts have survived the more than three centuries that have passed since they were made. Also, no one took the time to describe them in any detail in the journals, letters and wills which mention them. It can only be surmised from what is known of the conditions prevailing at the time how these quilts made by the earliest colonial women must have looked; not very pretty, because they were composed only of the stronger, though already worn pieces of material cut from otherwise unserviceable clothing. They were made more as result of accident borne of necessity, than design. There were two ways to make a crazy quilt. In the first, each tiny piece was fitted together with others like a jigsaw puzzle and pieces were just as irregular in shape. Sometimes if a piece was too large, it was cut into smaller ones to maintain a sort of average of dimension in a general area. This was the beginning of the organization of design. The second type of crazy quilt was made at a later date and in it were put scraps of silk, velvet, brocade, plush satin, wool, cotton and linen. Bits of a wedding dress might be sewed next to a remnant from a scarlet uniform. These quilts were for the most part made in blocks (the square units of design that make up a quilt). The designer determined the size of the quilt and then decided just how many blocks she wished to put into her "top". When the maker of this type of quilt decided on the size of her block, she proceeded to baste her irregular pieces upon it. These background blocks were usually made of coarsely woven sackcloth. A lady made pieced quilts until she was sure of her craft. When she felt she had developed enough skill, she would begin a "masterpiece" quilt. These were exhibited at county fairs and testified to the master needlewoman's expertise. A fine quilt handmade by the owner was an enormous status symbol. Elaborate appliquéd quilts were considered so difficult an accomplishment that only they were considered to be masterpiece quilts. Before the electric light was invented, women would often start two quilts at the same time. The utility quilt could be a pieced or crazy quilt, that would make use of scraps left over after cutting the sections for the masterpiece quilt. Also the seamstress could work on this quilt when she was tired or the light too poor for her best efforts. Later when the crazy quilt became an accepted and even coveted artistic and skillful form of needlework in its own right, fabric was not spared and embroidered seam and border stitches and embellishments on the patches became art forms in and of themselves. It was not until the 1880's when patterns were becoming very graphic, that there was a nostalgic wish for things to be as they had been in the past. Changes were coming much too rapidly for most people and they seemed to want their quilts to represent an older and pleasanter time. This was nascence of the crazy quilt's trend to the heights of popularity and extravagance. Many were made to record family histories and pieces were gathered from many family members. Each piece would be embroidered with the name, birth date, death date (if needed) and an appropriate sentiment of the donor. Incorporated into it might be such things as a man's hat band, a leather bow tie and a piece of corset cover complete with lace. 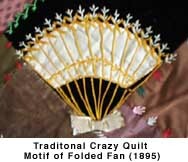 The first use of the word crazy, to describe a random, asymmetrical pattern in needlework was in the "Cultivator and Country Gentleman" in 1878. It referred to an embroidered canvas cushion, to be passed among friends. Each would invent and embroider her own design, and when finished it was returned to its owner. As the article suggested, "You will think it a 'crazy" cushion indeed!". Crazy patchwork reached its peak in the late 1880's, and continued to be made until as late as 1920. The most elaborate work, so ornamented with intricate embroidery, that the fabric itself was hardly visible, was much less common, however, in later decades. The Industrial Revolution, which occurred during Queen Victoria's reign, made Americans rich. These nouveau riche families now had much leisure time on their hands, as they could afford servants to do the mundane work. For a genteel lady, needlework was considered a proper use of her leisure time. These Victorian gentlewomen used fancy fabrics because they could afford these beautiful treasures. What better use of this leisure time than to sew bits of silk, velvet and satin into a coverlet and embroider upon the seams. 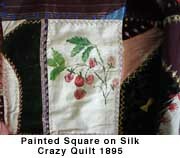 In the September 1882 issue of "Harper's Bazaar", the magazine gave this technique the highest praise; "In the old calico quilts the design was very stiff, and the colors rarely chosen with any eye to effect. Now we are very daring; we go boldly on without any apparent design at all and produce in the end a result which will in some cases challenge comparison with any richly stained glass." But why would these ladies use bits and pieces of fancies rather than purchase full yardages? It might be that the Centennial Exposition of 1876 was a primary influence for this trend. During this Exposition, Japanese art was highlighted. Some of the oriental ceramics of the time had a finish called crazing. This technique produced an overall random, broken appearance to the object's glaze. The influence of Japan on crazy work was both direct and indirect, The Japanese aesthetic is very different from the Western one: asymmetry is preferred to symmetry; a central perspective from a fixed viewpoint, a basic concept in Western art, is absent in Eastern art. Broken planes and the separation of planes by a strong diagonal, as well as objects occurring across a field of vision are all uniquely Oriental. Additionally, the Japanese had developed "a compositional style in which the most disparate pictorial forms-circle, oval, fan shape, double circle, gourd-shape, and the more usual rectangle and square - are used in conjunction, one format within another." Such a style might very aptly describe the American crazy quilt. A totally new aesthetic, one that influenced Western style in decoration and clothing, had an indirect influence on both needlework and other forms of decorative art. The frontispiece to Clarence Cook's influential decorating manual, "House Beautiful"' first published in 1878, displays Japanese fans prominently in a room setting that is itself a kind of crazy quilt of various styles of decoration and design. More directly, traditional Japanese motifs like storks, owls, and other birds, as well as dragonflies, insects, spider webs, butterflies, flowers and fans (both folding and panel shaped) began appearing everywhere. The Caron Collection's uniquely dyed threads offer the opportunity to wonderfully enrich and enhance your crazy quilt stitching and embroidery. Try a feather stitch in Evergreen Waterflowers; add lazy daisies in Rose Quartz Waterlilies; try Soie Cristale instead of mundane floss when embroidering your next rose. All these or even just one of them, will make a world of difference in the look and texture of your stitching, Your herringbone stitches will never be the same once you stitch them with Double-Dipped Rachel! 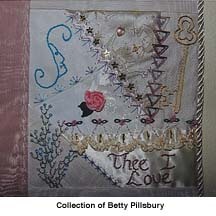 Click here for Part II of this Quilting Feature. 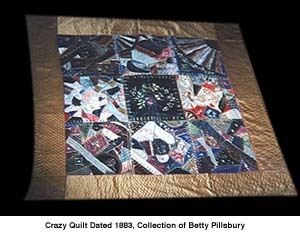 Quiltropolis Chat List - There is a chat list on the internet for crazy quilt lovers: http://www.quiltropolis.com and follow the links to mail lists and sign up. This group is more than 700 members strong and topics of discussion have included basic piecing ,to dyeing silk ribbon, to how to drill holes in seashells so they can be affixed to an ocean themed crazy quilt. Crazy Quilt Central web site - Your one-stop web site for all types of crazy quilting. Dawn Smith has set up an excellent site at http://www.geocities.com/Soho/Lofts/6531/ Here you will find links to antique quilts, contemporary works, frequently asked questions, book reviews and more. Vintage Vogue web site - Another wonderful site that showcases contemporary crazy quilting. Go to http://www.vintagevogue.com and follow the links to crazy quilts. Janet, who maintains this site, also carries many supplies for crazy quilting. Evening Star Designs mail order for quilting supplies - Located at http://home.att.net/~evening.Star.designs even has a crazy quilt club. Carolyn, the owner, will send a packet of coordinating fabric, threads, beads and some suggestions for embellishments for crazy quilting. Rita Vainius was honored to collaborate with Betty Pillsbury, an acknowledged foremost historian, teacher, writer, authority and creator of Crazy Quilts, on the above feature. COPYRIGHT NOTICE: No part of this feature story nor the included designs/charts can be reproduced or distributed in any form (including electronic) or used as a teaching tool without the prior written permission of the CARON Collection Ltd. or the featured designers. One time reproduction privileges provided to our web site visitors for and limited to personal use only.